As part of the commemorations of the Zeppelin bombing in 1917 (see here for more information), Sally Hogarth will be unveiling her new artwork memorial ‘Silent Raid’. The memorial to those who lost their lives has been commissioned by Southwark Council, and has been a year in the making. The memorial consists of 10 sculptured model houses, placed in 7 locations in the park, close to where the people lost their lives. Meet at Theatre Delicatessen, in the Old Library on Wells Way, for a walk around the locations for the memorial, with speeches, refreshments, a poem by Koko and more. To book tickets for the launch event, please see the Eventbrite page. The launch will be exactly 101 years after the attack and is part of the Zeppelin 1917 programme of events in Burgess Park about the First World War. Plans and production of the art installation by Sally Hogarth. Photos by Alexander Christie. An afternoon of FREE events at Theatre Delicatessen, Old Library, Wells Way. Come along to the open-to-all history walk telling the story of the “Silent Raid”. 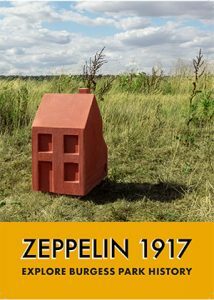 Find out more at the mini Zeppelin 1917 exhibition based on the centenary commemoration last year including Keith Roberts’ Zeppelin artwork. Listen to the fascinating podcast audio adaptation of the Animated Walk from the Friends’ Zeppelin 1917 season. Take part in the drop-in family art workshop by Art in the Park.